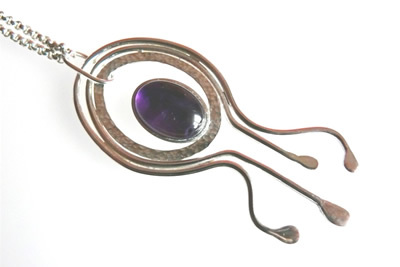 This is a stunning recycled sterling silver pendant, the centre has been reticulated to give texture then set with an amethyst cabochon, this was then soldered to the outer circle. Karen has been designing jewelery for over 12 years and creates original pieces using conflict free precious stones and silversmith techniques. All jewelery is individually hand crafted, using a variety of materials, sterling silver sheet, recycled silver, wire, copper, pearls, semi precious stones and crystals, making each piece unique. Karen is passionate about her creations and hopes it reflects in her jewelery. She has her own hallmark.